No true woodworker will be caught dead without a reliable belt sander in his shop. You will rarely hear of a novice carpenter who has an arsenal of belt sanders because these tools are strictly for the more experienced workers. To help you find your way through the maze of belt sander options out in the market today, we put together this brief review. Here, we take a look at some of the best belt sanders and a few alternatives you can get your hands on. When we were starting out in the formidable field of carpentry, we often had to use different tools and objects to come up with a nice and smooth finish. We knew we could always just get a belt sander, but the thought of having a machine accomplish such a delicate job seemed inconceivable. Over time, though, we sanded more, learned more, and became more skillful in handling our sanding projects. Eventually, we did manage to entrust our rounding, shaping, and trimming needs to belt sanders and we never looked back since. 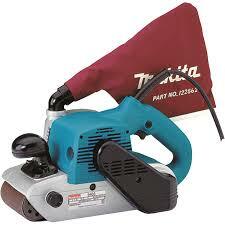 The belt sander that successfully converted us was the 9403 belt sander by manufacturer Makita. Its power and performance give you a very good reason to splurge a little bit. The only thing you may not like about Makita’s 9403 is its hefty price tag. However, as is always the case in the world of power tools, you definitely get what you pay for. The 9403 is definitely the best sander we have seen in a long while. What we love the most about it is its sheer power. Given the price, we naturally expected an excellent performance out of this belt sander and we were not disappointed. The other thing we like about it is that it is relatively quiet compared to other sanders with the same capacity. It is also quite heavy, which offers a lot of stability when working on vertical surfaces. The price of the DS321 is in the lower ranges but its performance is comparable to those of more pricey belt sanders. Its impressive performance is precisely why it remains a favorite among power tool lovers and woodworkers. The feature we like the most about this belt sander is the small corner wheel, which allows the unit to get in tight and difficult spaces. The DS321 is also fairly lightweight and comes fitted with a neat dust-clearing feature. Because of its structure and its corner wheel, the DS321 is highly recommended for smaller jobs. We like the compact and lightweight design of the 6321 belt sander. Its structure makes it applicable for sanding in tight areas and difficult angles. However, a lightweight body can only handle so much, which is not really a bad thing especially if you do not do a lot of heavy-duty sanding. Although Wen’s 6321 is the cheapest belt sander we have seen, we can’t say the same about its quality. For a very low price, this tool surely packs a lot of power and overdelivers. We recommend it for projects with light sanding needs. Belt sanders are for experienced woodworkers, carpenters, and DIYers who are very particular about the outcome they want to see. Belt sanders have a linear sanding action, allowing you to sand with the grain. There are some tools you can use in place of a belt sander but none of them are able to produce such excellent results in so little time. They are also highly versatile. You can use a belt sander to trim, sand, level, round, or shape. However, the highly powerful nature of belt sanders can make them intimidating if you are not used to working with them. This is why you rarely see them in small basement DIY shops that do not encounter a lot of complicated sanding jobs. It takes skillful hands to successfully operate a belt sander. As we mentioned earlier, belt sanders are one of a woodworker’s main workhorses. It can serve a lot of purposes if used correctly. In addition, it is the belt sander’s work that gets noticed first on your workpiece. Use the wrong one and all your hard work will go unappreciated. Here are the things you need to look out for when shopping for belt sanders. Belt sanders come in all shapes and sizes. There are compact ones, mid-sized ones, and big and heavy ones. The size of the tool is one of the main factors that determine what that belt sander should be used for. If you are working on only a few small projects that require sanding, you should be fine buying a compact or a mid-sized belt sander. Meanwhile, if you have a lot of sanding to do or are working on a few but heavy-duty jobs, the safest thing to do is to go for a full-size belt sander. Usually, these are the ones that can be mounted on workbenches for stationary sanding. Fixed-speed belt sanders are ideal for use for generic woodworking projects that do not require meticulous sanding. If you need flexibility in terms of application and sanding quality, though, you may want to buy a variable-speed belt sander instead. As the name implies, a variable-speed belt sander has a trigger you can manipulate to adjust the belt’s rotation speed. This feature lets you prolong the sander’s life because the belt will be running only when needed and at only the necessary speed. Obviously, the higher the amperage, the more powerful the belt sander is. However, stronger is not always better. In fact, using a belt sander with far too much power relative to the workpiece and sanding difficulty can even destroy your project. If you do not have any heavy-duty sanding jobs lined up anytime soon, you can settle for amperages in the lower ranges. If you do sand heavily often (say, a contractor who uses a belt sander nearly every day), you strictly have to go for belt sanders with high-amp motors. Such heavyweights can endure a lot of workshop-related abuse and still produce flawless finishes without showing the slightest sign of bogging down. Run by a 7-amp motor at a speed of 820 feet per minute, this belt sander from Wen is an excellent but low-profile worker. It costs so little but does so much. It is also lightweight, weighing merely 6 pounds. As a neat add-on, a dust bag is installed on the belt sander to make cleanup easier. There is also a feature that allows you to lock the trigger during operation so you do not have to strain your hand or finger by holding the trigger for long periods. This unit comes with a two-year warranty and the support of one of the largest networks of repairmen in the country. The 6321 is designed and built to let you sand the easiest way possible. Because it is so small and light, this sander can work in tight spaces just as it can on open surfaces. It is also quite portable so you can bring it to an outdoor or a remote worksite without so much as feeling the slightest weight. Fatigue is also not a problem. We’re sure your arm won’t mind if you use this belt sander for as long as you need to. Looking at the 6321’s retail price, we honestly did not expect it to have such a good motor. At 7 amps, this motor can handle easy to moderate sanding operations without showing any signs of breaking down. Just do not attempt to use it for heavy-duty sanding jobs. Not only will that slow you down, it can also damage your belt sander. 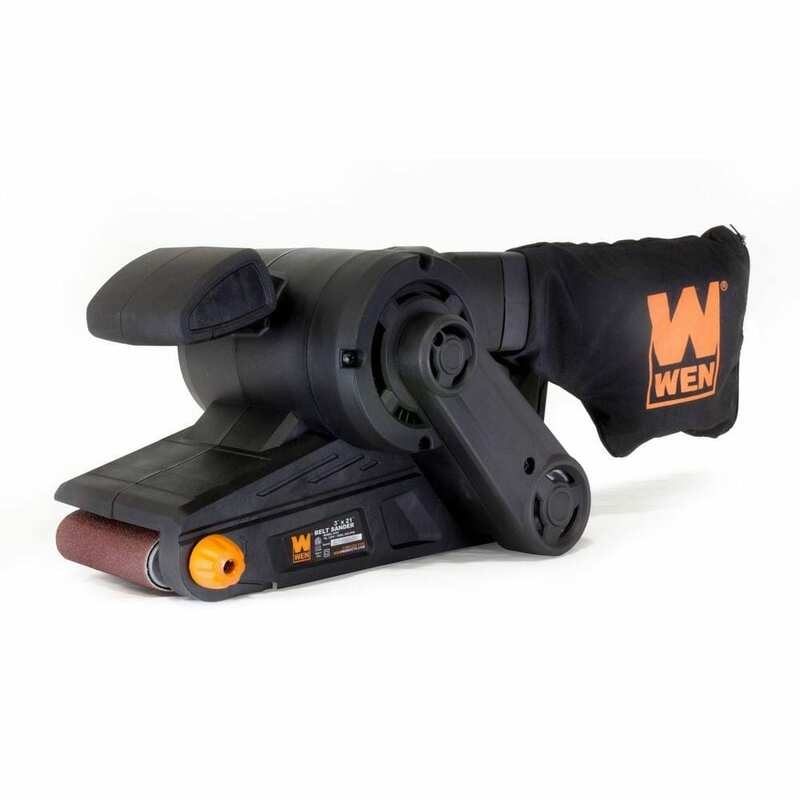 Say goodbye to tired and numb fingers and hands with the Wen 6321 belt sander’s lock-in feature. If you find yourself working with quite a rough piece and you think sanding will take a while, you can lock the 6321’s trigger in the “on” position instead of having to hold it throughout sanding. Dust is as problematic as it is small and continues to be a silent enemy in the workshop. The 6321’s detachable dust bag is designed and installed in such a way that it easily collects most of the dust created during sanding. This lets you work more easily and with less downtime and cleanup. Wen’s 6321 belt sander is insanely cheap, and we mean that in the best way possible. However, despite the fact that its price is in the lower range, it delivers a kind of performance that you are likely to find in a bit more pricey sanders. The 6321’s affordability makes it ideal for those starting out in woodworking or those who have relatively easy to moderate applications. Another good thing about Wen’s belt sander is that its front roller reaches past the top of its housing. This design lets the belt itself sand even in difficult-to-reach areas. Another favorite in the low price range category, Generic’s Mini belt sander does best in light sanding work. Its belt measures 1 inch by 30 inches and has a vacuum diameter of 1.75 inches. True to its name, the Mini belt sander is run by a 3-amp, 360-watt motor. Its table measures 5 inches by 5 inches and can be tilted up to 45 degrees. This belt sander from Generic does not promise much but if all you need are a cheap price and a fair performance for light sanding work, it will definitely satisfy your expectations. The Mini belt sander’s body is fitted with a soft-grip feature that enhances comfort and reduces the likelihood of fatigue. Sanding can be harsh on the arms especially if you are working on exceptionally rough surfaces and a lot of the vibration gets transferred to you. The Mini has a built-in fan that is designed to keep as much dust as possible out of the way during sanding. This means you get to continue working for longer intervals, have shorter downtimes, and an effortless cleanup afterward. The automatic belt tracking feature of the Mini is surprisingly highly effective in keeping the sandpaper steady even when working on jagged surfaces. Most of the time, you would only see such a well-designed feature on higher-end models. The Mini is indeed mini. It is fairly lightweight and built in a shape that can be stored nearly anywhere and can sand even at odd angles. Its lightness also greatly contributes to its ease of use, as it helps reduce or delay fatigue. The 9403 offers quite a list of features that justify its relatively more expensive price. It is powerful, it works excellently, and remains quiet the entire time. It is run by an 11-amp motor, which rolls the belt at an impressive speed of 1,640 ft/min. As is the case with heavier, more powerful belt sanders, you would expect the 9403 to be extremely noisy. However, its noise level falls at merely 84 decibels. Sure, we still advise the use of noise-cancelling gear, but it is significantly quieter than most of the units available today. The 9403’s belt has a width of 4 inches and sands at a speed of 1,640 feet per minute. It is the combination of these that let the belt sander remove a lot of material quickly, making this tool highly efficient even with very rough surfaces. This belt sander from Makita runs on a high-performance 11-amp motor. It can take on sanding jobs of any difficulty even for extended periods. We recommend this belt sander for contractors or DIYers with heavy sanding work. The unit’s built and motor can withstand workshop abuse for years. A tool this large and powerful is bound to encounter a lot of vibration. Good thing the 9403 is designed to have a large front grip that maximizes comfort and minimizes exhaustion. Aside from improving grip, this unique design reduces the transfer of vibration from the tool to your arm. For a belt sander this expensive, good performance is nearly not enough. Durability is an important factor as well. The 9403’s labyrinth-style construction protects its inner bearings and its motor from contamination. One of the best features of this belt sander is the uniquely designed front roller, which extends just enough to reach into tight corners. The design also reduces the need for flush sanding. The Dragster DS321 has a compact and lightweight design that features a retractable multi-position handle. It also has its own dust collector and a tool-free belt change mechanism. Taking all of these key features into account, we recommend the Dragster DS321 for home DIYers looking to spruce up their kitchen with some nicely finished woodwork. The Dragster’s front roller extends just far enough from the housing to let you sand in narrow spaces easily. Flush sanding is not an issue with this design too. There are many advantages to having a compact and light belt sander. One of the more obvious ones is portability. You can take the Dragster DS321 virtually anywhere because it is easy to carry around and does not take up too much storage space. The other main advantage is the reduction in fatigue. When you are looking at several hours of sanding in front of you, the last thing you need is a heavy belt sander that will make the job even more difficult. The Dragster DS321’s handle is retractable and has a three-position design. This feature enhances grip, control, comfort, and portability. An ingeniously designed dust collector is fitted into the DS321. Its design allows the collector to clear the work area during sanding, which is really more important than simply making post-sanding cleanup easier. Instead of having to grab a couple of tools to switch belts, you can just use the belt release lever and the adjustment knob on the Dragster. This convenient design significantly decreases downtime and greatly increases productivity. 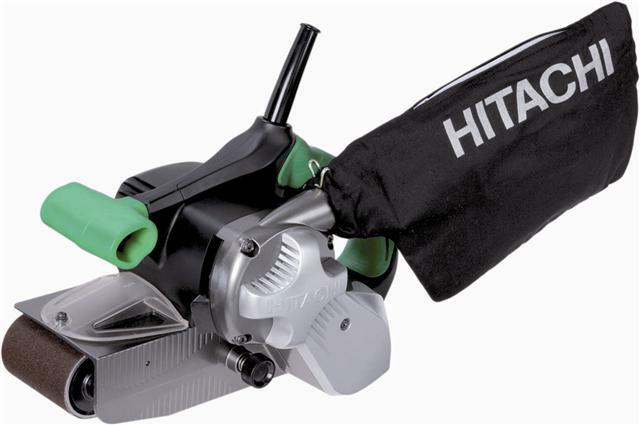 The SB8V2 from Hitachi is unique in that it is a variable speed belt sander. It has a minimum speed of 820 feet per minute and a maximum of 1,475 feet per minute. Its handles are fitted with a soft elastomer material. The body of the sander has a tracking window that lets you see the surface of your workpiece and the sanding belt itself. This tool comes mounted with a dust collection bag that helps keep your work area clean even when sanding corners. One of its main secrets, though, is the durable V-belt that prolongs the belt sander’s life. Like many belt sanders on the market today, the SB8V2 has a lock-on trigger feature that holds the trigger in place during long operations without requiring you to hold it. It may sound like a small feature but it helps a lot in the workshop. Sanding is one of the last things you do when woodworking but it is by no means the easiest. It can be exhausting especially when your workpiece is rough and hard. The SB8V2’s main and auxiliary handles are fitted with soft elastomer material that improves control and reduces vibration. Manufacturers rarely make variable speed belt sanders because these tools have a fairly narrow functionality. However, variable speed control benefits both your workpiece and your belt sander. By putting you in control of the sanding speed, you get to avoid unexpected marks on your wood. Also, because the belt will not be unnecessarily running, the tool’s life is extended. The dust collector of the SB8V2 is left-mounted to keep it out of the way when you are sanding corners. It may sound like an insignificant feature but you will be thankful for it once you put it to work. The SB8V2’s V-belt is designed to withstand anything between normal wear and tear and outright abuse. This simple feature design can do as much as double the life of your tool. Many of its positive reviews revolve around how much it is worth its cost. People are pleasantly surprised that the 9403 is up to nearly any project they used it for. It is commended for being powerful, well-engineered, and sturdily built. Although this belt sander is not spared from getting negative reviews, we were not able to find recurring complaints about the tool itself. Many of the comments had to do with shipping, with buyers getting “obviously used” items despite ordering brand new units. All in all, it looks like Makita fans--old and new--agree that the 9403 belt sander is a worthy investment. Astro’s air belt sander’s design and material make it ideal for spot weld removal. It also comes with a few sanding belts of its own that can take on a few metals. It has a simple, lever-based belt change mechanism in place for added convenience. It is also quite versatile. The 3037’s pulley can accommodate sandpapers of different grits and standards. Like our top choice for this review, this automatically tracking belt sander from Makita is quietly powerful, running on an 8.8-amp motor with a noise level of 85 decibels. The other thing you may like about it is its variable speed control, which allows you to run it between 690 and 1,440 feet per minute. Finally, it comes fitted with a spacious dust bag and a power cord measuring over 16 feet. The 371 belt sander from Porter Cable seems to have it all covered. It has features that promote performance, durability, comfort, and convenience. It runs on a high-performance motor and has a flush side that allows you to sand perpendicular areas. The 371 is made of sturdy metal components that improve performance, durability, and tool lifespan. It has a rubber grip that is textured to provide comfort during long sanding work. Finally, the 371 is sealed to prevent dust from contaminating the interior parts. The 362V from Porter-Cable is one of the most powerful belt sanders out there today. It has a 12-amp motor, which can handle professional-grade jobs effortlessly. Its body is designed such that it can be used for sanding vertical surfaces, which can be hard to do using other sanders. The trigger has a lock-on feature and is conveniently located on the handle. The 9741 belt sander from well-known power tool manufacturer Makita is one of the best mid-range belt sanders available today. 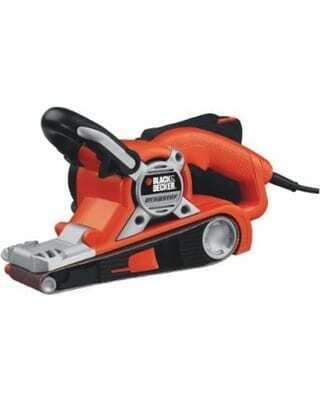 Its sturdy body houses a 7.8-amp motor which can make the belt sander run at a speed of 3,500 rpm. It comes with several add-ons that make it ideal not just for sanding wood but also for removing rust and paint. The 9741’s motor is strategically located to provide a low center of gravity, balance, and stability. The 9031 from Makita has a small belt that is ideal for finishing work on furniture or carpentry projects. Since the pulley is narrow, the belt sander can work in narrow spaces without compromising the finish. It is also quite light, weighing only 4.6 pounds. If you have a delicate woodworking project that will take hours to sand, the 9031 is a good choice of tool. As if those were not enough, the 9031 has variable speed control, which you can manipulate through a dial. The GBS321A is an ideal mid-range belt sander for delicate sanding jobs where bulky and heavy sanders won’t fit. It has a low profile design that can effortlessly work its way through hard-to-reach areas and corners. With an 8-amp motor, the GBS321A can easily take on most easy to moderate sanding operations without a hitch. It has an automatic belt tracking system, variable speed control, and a conveniently long power cord. Unlike most belt sanders, which are made of reinforced plastic, the 352VS has an all-metal body. It holds up well against normal wear and tear, damage, and the daily abuse that goes on inside a woodworking shop. Its speed varies from 650 to 1,300 SFPM. Running this belt sander is an industrial-grade 8-amp motor that will work fine on anything between delicate carpentry projects to medium-duty jobs. The 9032 is ideal for sanding in tight spaces on wood or steel. Even if you use it heavily on rough and hard surfaces, you do not have to worry about wearing the belt sander out prematurely. Its body is designed so that the work is evenly distributed throughout the belt. The sanding arm is adjustable and can pivot up to 100 degrees for added versatility, comfort, and ease of use. The best thing about the BR318 is the simplicity of its design and mechanism. It is also highly affordable, making it an ideal starter tool for those who are new to belt sanders. The BR318 has all the basics: ergonomically designed handle grip, a narrow body for getting into narrow areas, a two-year warranty, and a well-engineered motor that does as it promises. Instead of tiring your hands and arms out trying to level stubbornly rough edges using substandard belt sanders, let the Makita 9403 Belt Sander do the job for you. Not only will it produce the smoothest finish you can ever hope to have, it will do so in the quickest way possible. Having a durable and well-built body and admirable power, this tool deserves a permanent spot in any woodworking shop. 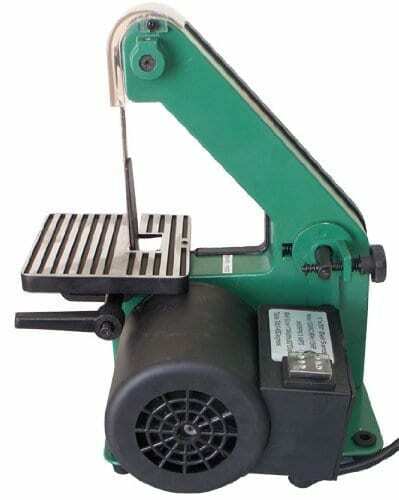 If you are looking into purchasing this belt sander, find out more about it here.